UniTrends Software Corp.'s PC ParaChute does automated backup and recovery of networked PCs. UniTrends claims an administrator can resuscitate a dead network without having to reinstall the client operating system, registry, patches, applications and data stored on the hard drives. PC ParaChute's single, bootable diskette aims to recover data without direct user involvement. 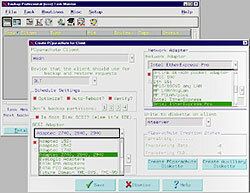 It schedules a system backup to a central server and does bit-level verification. UniTrends of Myrtle Beach, S.C., charges $50 per copy of ParaChute sold in units of 10 with the server software, Backup Professional. Both products run under Microsoft Windows 3.x, Windows 9x, Windows NT, SunSoft Solaris, Linux, Novell NetWare and Santa Cruz Operation UnixWare. The company, whose Web site is at www.unitrends.com, has customers in the Air Force, Army and NASA. Contact UniTrends Software at 800-648-2827.